In a fantasyland where it rains bacon, shoulder massages cost a nickel, and parking tickets are actually Starbucks gift cards, you can totally afford to go to online college simply for the love of learning. But here, in the real world, you need to get paid. We’re sympathetic to your priorities. If you’re in online college right now, or planning to attend online college, employment is one of your utmost concerns. Obviously you’re here to learn. Obviously you plan to grow as a person. Obviously it’s cool that you get to take a few electives simply for personal enrichment. But when all is said and done, you aren’t out there earning a degree just so you can staple it to the wall and hang out in coffee shops pontificating the mysteries of life. Unless you plan to work in a coffee shop and have the ability to multitask, in which case, pontificate away. You’re all set. For the rest of you, getting a degree from your online college needs to lead somewhere, which means somebody has to hire you. So the big question is, will employers take your online degree seriously? 1. Is your online degree serious? If you want your online degree to be taken seriously, start by making sure that it’s a serious degree, which is to say that it has been granted by a properly accredited online college. The institutional accrediting sector is divided into regional and national accrediting agencies. As a general rule of thumb, regional accrediting agencies carry more credibility and merit. When you’re seeking out a college or university, you’ll really be looking for the stamp of approval from one of the regional accrediting agencies shown in the sidebar here. Only accredited colleges or universities are eligible for financial aid. Moreover, accreditation typically indicates that an institution is not only maintaining its standards but that it continues to advance and remain current within its field. Credible regional accreditation has never been more important to employers than it is today. Accreditation helps your prospective employer differentiate your online degree from the junk degrees that degree mills and shady for-profit schools have proliferated into the marketplace. Employers aren’t inherently wary of online degrees, but they are wary of degrees that come from places like — oh I don’t know, just drawing off the top of my head — Trump University. If your degree should happen to have so disreputable an institution’s name stamped to it, you are likely to get the big side-eye from would-be employers. Employers are aware of the risk created by meaningless junk degrees. If you went to an online college, you can be sure that most employers will scrutinize your degree for evidence of accreditation. If you’ve done your due diligence and you know your degree is recognized by one of the seven aforementioned regional accrediting associations, relax. You’re good. 2. What else can you tell employers about your educational experience? Accreditation is usually a prime determinant, but there are also other indicators of just how serious your degree should be taken. Factors that prospective employers will likely consider are the length of your degree program (if it’s too short, it will arouse suspicion), the availability of actual academic support (no guidance counselors is usually a red flag for a for-profit racket), fee structure (legitimate schools usually charge per credit hour as opposed to per program), and of course, whether or not you actually did coursework (getting a master’s in exchange for a credit card number is usually a dead give away that you’re attending a degree mill. 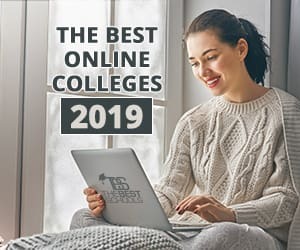 If you’re looking for an accredited online college that employers will take seriously, our list of the 50 Best Online Colleges & Universities 2019 is a pretty good starting point. 3. What kind of job are you looking for? You can get a perfectly valid online degree in healthcare administration, but we probably wouldn’t recommend becoming a doctor strictly through web tutorials. You can almost certainly learn everything there is to know about the economics of international petroleum through an online course, but we wouldn’t necessarily make you the captain of an offshore oil rig. You can study motorcycle repair through an online trade school, but that doesn’t make you the Fonz. You get the point. If you plan to parlay an online degree into a decent job, start by making sure that you’re working your way into a field where online degrees are regarded as being at least equal to traditional degrees. Plenty of degrees — liberal arts and sciences alike — can be earned online with little to no change in curriculum, content or even instructional approach. There’s obviously nothing stopping you from reading about history, learning how to write code, or mastering the basic theories of communication from the comfort of your own computer. Chances are good that your employers will see it the same way. Not so for jobs that require the mastery of certain practical skills, nor for those that demand an intensive level of professorial mentorship that simply can’t be obtained online. You can get an introductory level look at the study of psychology, but you’ll need to attend a graduate program in the physical world if you plan to practice at the clinical level. You can earn an associate’s degree in nursing without ever leaving your house, but you’ll need to get your certification by refining your professional skills in an actual healthcare setting. While you can get in at the ground floor for any number of professions by going to online college, some career paths simply demand a measure of real-world educational experience. A future employer in one of these fields may take your online degree seriously, but only to the extent that it cleared a path for you to eventually earn the appropriate traditional degree or certification. 4. Will employers be familiar with your degree? So if you apply for a job and your employer is like, “What’s an online degree?,” it’s possible you’ve stumbled into a wormhole and landed in 1989. As long as you’re there, do two things for us: talk Axl Rose out of ever making Chinese Democracy and warn everybody you meet that Back to the Future II is actually a documentary. Once you’re done, get back to present day where, according to a poll by Excelsior College and Zogby International, sixty-one percent of CEOs and small business are familiar with online learning programs. Of those, eighty-three percent believe an online degree is as credible as one earned through a traditional campus program. Of course, these same employers reiterated just how important accreditation is to this credibility, as well as the general quality of an online institution’s graduates and the reputation attached to its name. That said, there are some perfectly reputable online degrees that may be somewhat new to employers. For instance, competency-based education is still a new concept. For many employers, it’s not just new but fairly unfamiliar as well. If it’s unfamiliar to you, competency-based education (CBE) is an approach to learning that centers on the mastery of concrete skills which are applicable in real and specific workplace settings. Its focus is on practical skills rather than abstract, theoretical, or creative dimensions of a subject matter. A commonplace model of online education, CBE can lead to both degrees and professional certifications. But how do employers feel about these degrees and certifications? Well, they’re just not sure how to feel yet. This is to say that employers are receptive to the concept but they also believe schools using CBE models would profit significantly from their input. While the benefits are apparent, some employers may see this type of curriculum and training as unproven. Our advice, if you’re looking at an online program that happens to employ a CBE model, is to reach out to prospective employers in your field. While you’re exploring your options, find out if employers in your field recognize CBE certifications or degrees. If you find that your would-be employers are unfamiliar, you might consider a different approach to earning your degree. 5. What level of degree have you earned? Associate’s? Bachelor’s? Master’s? Any of these can be earned online, but which one do you need for the job you want? For many employers, the fact that your degree was earned online is of must less importance than is your level of degree attainment. There is often a close correlation between degree level and your future potential for advancement or earnings. In many fields, a two-year associate’s degree will limit you to entry level and assistive roles with fairly concrete limitations to your upward mobility. In this case, it is not the fact that your degree was earned online — but the fact that it only represents completion of a basic two year program — that could be limiting your opportunities. Whatever your career aspirations, try to get a strong sense of industry norms as they relate to degrees. If a bachelor’s degree is the most basic point of entry for the job you desire, find an accredited online college that offers this four-year program. The same advice applies if the job you seek demands an advanced degree. Know before you hit the job market exactly how far your degree level can take you. This should tell you a lot about how employers will receive your online degree. Also bear in mind that the level stated on your degree means pretty much nothing without accreditation. An associate’s degree from a regionally-accredited online school is worth more than the Master’s Degree that you earned from the Online University of Learning Stuff. 6. What else are you bringing to the table? Where you complete your undergraduate education is only one part of what employers look at. If your resume is scrawled on the back of a placemat from Denny’s and it identifies the three weeks you spent walking your vacationing neighbor’s dog as “managerial experience,” it won’t matter where you went to school, online or otherwise. The fact that you went to online college is just one of many dimensions of your employment profile. Your resume, your skills as an interviewee, your personal connections, and whether or not you show up to the interview in sweatpants are all factors in shaping your employability. An employer is likelier to take your online degree seriously if you yourself present as a candidate worthy of being taken seriously. Seek assistance in crafting the perfect resume for your field, put real thought and effort into each cover letter you write, prepare well for interviews, and find ways to highlight your skills and passions — both academic and personal. The online college that awarded you your degree should be a single strand of a much large tapestry. If you can effectively present yourself as the colorful embodiment of that tapestry, you’re online degree should blend nicely. 7. Is it obvious that your degree was earned online? If you got it from a school that is also known for its brick-and-mortar campus, chances are pretty good that employers won’t even know or think to look… not that it’s anything to hide. It’s just that a degree earned online from a traditional university is often viewed with the exact same level of credibility as is a degree from the university’s physical campus. The credibility of your university on the whole is sufficient enough in most cases. Where this is true, most employers don’t really care whether your drove to class or just logged in for it. Either way, you might consider the fact that your future employer may not realize or even give second thought to the fact that your degree was earned online. This is not a major concern, nor even a minor one, for those employers who simply view online education as one of many tributaries to the greater flow of employable graduates. If it never comes up during the interview or hiring process, it’s probably because your employer recognizes and accepts the mainstreaming of online education. 8. What are your reasons for pursuing an online degree? Whatever you do, don’t say it’s because you wanted the freedom to learn while clipping your toenails. I don’t care if it’s true. Come up with something better. Seriously though, employers may be cool with your online degree, but they might also be fishing for a satisfying explanation for why you chose this route. We trust that you have a pretty good reason, whether it’s because you were balancing work and life responsibilities, looking for a financially responsible way to advance your education, or because you were genuinely attracted to a specific program that happened to be online. Whatever the reason, practice articulating that reason and tell it in a way that highlights your strongest qualities, from your dogged commitment to your education to your incredible time management skills. This is something that may come up in your interviews. Prepare accordingly. If you're going to invest in an online degree, do it in a way that will lead to future earnings. Ultimately, your strength as a candidate depends as much on you as it does on your degree. If you have the qualities of an employable person — diligence, persistence, the ability to express yourself clearly, strong personal references — you can create your own opportunities. That said, if you’re going to invest in an online degree, do it in a way that will lead to future earnings. And good luck!